Lester Bouah, general manager - investment promotion at South African agency Trade and Investment KwaZulu-Natal, explains the benefits of the province of KwaZulu-Natal as an investment destination. What have been some of the key developments in KwaZulu-Natal (KZN) since we last interviewed you a year ago? Lester Bouah: The National Planning Commission has created 18 strategic integrated projects (SIPs) aimed at the development and improvement of requisite infrastructure for the country over the next ten years. The significant focus for KZN is the economic logistics corridor between KZN and Gauteng, including some parts of the Free State. This will look at the expansion of road and rail connectivity (passenger and cargo) to and from KZN. Furthermore, two Special Economic Zones (SEZs) will be established in KZN: one in Richards Bay and the other in the region of King Shaka International Airport and the Dube TradePort air link. These will be supported by District Industrial Hubs, which will act as opportunity feeders to the SEZs. Why is KZN considered a hub of industrial development in sub-Saharan Africa? The port of Durban is the busiest and most efficient port in sub- Saharan Africa, moving the bulk of containerised cargo. Goods destined for neighbouring countries in the SADC (South African Development Community) region come through the port and are transported via road or rail to the hinterland. In some cases, they are transshipped via Dube TradePort and sent to other destinations. KZN is also a thriving manufacturing hub, with chemicals, automotive, plastics and injection moulding, agro-processing and mineral beneficiation being some of the leading industrial activities of the region. Which countries have invested the most over recent years, and what do you think are the reasons for their investment? China, India, Japan, the Republic of Korea, Malaysia, the UK and the US have been sources of foreign direct investment (FDI) for KZN and the rest of South Africa. Some of these countries have traditionally been investors; there has just been a shift in terms of the importance of their FDI (from the West to the East). As with many African states, China has become a big player in South Africa; however, the type of FDI has been different to that in neighbouring African markets. In South Africa, the focus has not been on ports, road, electricity and other basic infrastructure needs, as our infrastructure is well defined - particularly in KZN - and on a par with that of many Western nations. Opportunities are sought in the services, manufacturing, chemicals and agro-processing sectors. Eastern countries have viewed investments in our region from a springboard perspective, looking at the greater sub-Saharan market rather than just the 51 million-strong population of South Africa. Could you give an overview of some of the incentives you offer foreign investors, such as the Enterprise Investment Programme (EIP)? The Manufacturing Investment Programme (MIP): the objective of the MIP is to stimulate investment within the manufacturing industry. Qualifying investment costs would comprise machinery, equipment, land and buildings, and commercial vehicles. The Tourism Support Programme (TSP): the objective of the TSP is to stimulate employment, and broaden and expand the geographic spread of the services on offer for tourism investment. Qualifying marginalised areas advancing spatial economic activity: the manufacturing and tourism incentive programmes stimulate industrial and tourism investment throughout the nine provinces of South Africa. Could you tell us about some of the newly established foreign companies in KZN and their reasons for investing? Noteworthy investments have come from British company Coracall, which has the potential to employ 1,500 young people, and CCI Call Centres, which will ultimately employ 4,500 at its offices in Umhlanga and La Lucia, north of Durban. What value-added services does Trade and Investment KwaZulu-Natal (TIKZN) offer companies wishing to invest in your region? The province of KwaZulu-Natal is the first South African province to launch an Investment Protocol Handbook. This serves as a guide to business policies and processes in KZN, with a focus on the ease and cost of doing business with regard to local and foreign investments. The Investment Protocol Handbook provides a platform for understanding and transparency within the business environment, which will ensure that all parties adhere to the same rules and regulations, while the duration of previously lengthy processes may be shortened. The handbook covers issues such as the costs of doing business and the regulatory environment, in terms of compliance processes and the length of time it takes to complete these. the provision of project support and after-care services to investors. to investors with securing project and operational finance. TIKZN strives to strengthen relations with local government to ensure a coordinated approach to investment promotion and facilitation in the province, and to make sure that infrastructure and social development interventions are identified and implemented. Local government plays a pivotal role by providing pertinent information on the current business environment and the challenges faced by existing businesses. How do you see KZN developing economically and socially over the next few years? The global financial crisis has also had its impact on South Africa. Our economy has slowed down, but our National Development Plan with its emphasis on infrastructure spending and development has created abundant opportunities that will have a positive impact on the social and economic landscape of KZN. €22.5 billion have been set aside for port and rail infrastructure development; of this, approximately €10 billion will be spent in the KZN region. The direct economic impact would guarantee the improved and expanded infrastructure projects in terms of road, rail, ship and air. These will lead to improved efficiencies, increased capacity and, ultimately, job creation, improving the socio-economic environment of KZN significantly. 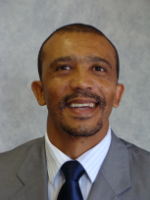 Lester Bouah, general manager – investment promotion at South African agency Trade and Investment KwaZulu-Natal.